2 mornings full of lectures on topics the clinicians requested training on. We’ve donated a cryotherapy machine, which will allow the clinic staff to run cervical cancer outreaches on a monthly basis. This initiative will be supported by a county gynecologist who will attend the outreaches in order to continue the training on identifying abnormal lesions and proper removal of those lesions (also sponsored by Naweza). We’ve conducted fungal and scabies screening on over 300 kids and administered drugs for treatment and education to aid prevention. As is tradition at Lewa, we had a special ceremony where we all offered feedback on the week and thanks for each other. Their thanking us for coming and our thanking them for making us feel so welcome. We then participated in a cake cutting ceremony where we all put our hands on the knife and cut the first piece together, symbolizing unity. 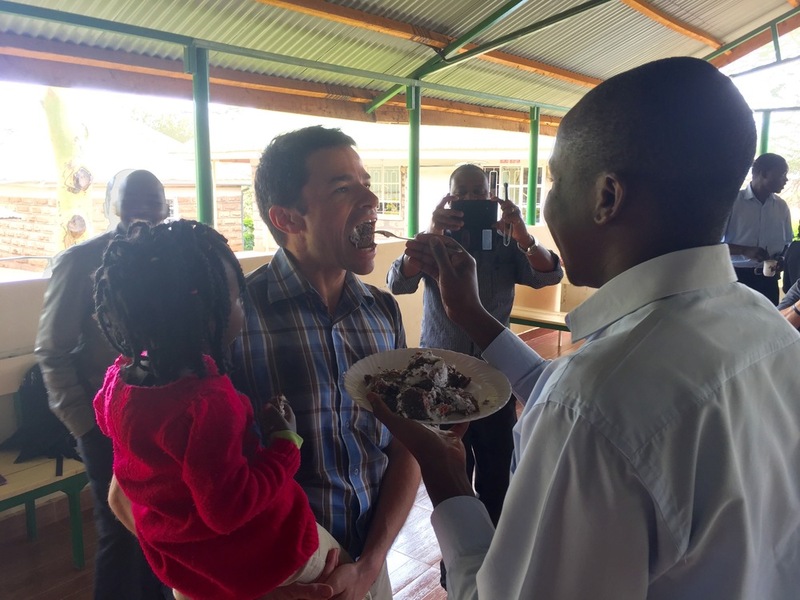 The next part involved us being paired up with the person who we had been partners with for the week and then feeding him/her a small piece of cake, signifying a binding between Lewa and Naweza. And as we would feed each other one by one everyone would chant “Naweza” or “Lewa” in unison. And then of course lots of Masala tea (my personal favourite, with loads of sugar). The entire ceremony was so touching. It was evident they value the relationship and hope it continues into perpetuity. The ingredients of the cake coming together as one was supposed to represent that Lewa and Naweza were now one. The symbolism was everywhere! The request for us to come more often was heard too many times. And we would respond always with, we will try our best. But for sure our next visit will be around January next year. And we’ll continue with our bi-weekly call keeping us in consistent contact with them, helping them navigate complicated case files as well as us tracking the progress of the Chronic Disease program. The journey is long, especially given a finish line that is as elusive as this one. So you must enjoy the process and the people you are with. I want to thank the amazing group that worked with me on this trip. Dr. Ed, his wife Denise, Dr. Paul and his partner Cheryl, Dr. Sidiqa, Vanessa and Dr. Michael (who has been on every trip with me from inception and is the mind behind many of these initiatives). Everyone worked incredibly hard, in very difficult conditions, for many many hours a day and into the night. But we always managed to have a good time. I tell everyone who comes on this trip, your coping mechanism for stress must be laughter, otherwise it may not be for you…because it can be very stressful and very uncomfortable. I read recently “A comfort zone is a beautiful place, but nothing ever grows there.” I can of course only speak for myself, but I have been forever altered by the encounters I’ve had through Naweza. The strength of character and resiliency of the Kenyan people have made a deep impression on me and I think of them often when I’m going about my regular day. I’m equally affected by everyone who works with me on Naweza, whether it be the people who come with me on the trip or the many more who help me from the Medcan office in Toronto. All of the “staff” do so on a completely volunteer basis. They give time on top of their regular duties in order to support these 2 clinics in rural Kenya. It is a true act of humanity and I’m grateful for their generous spirit and sense of responsibility to help those in need. So, I think that’s about it for now. Thanks for all of your support and time it took to read some of my way too long entries. Our next planned trip is end of January and we are exploring the idea of adding a clinic in Uganda. It should be interesting if nothing else! Make sure to follow us on Instagram https://www.instagram.com/medcannaweza/ and Facebook https://www.facebook.com/medcannaweza/ to keep current on our initiatives and goings on. And we’ll continue to share photos from this trip throughout the year. We literally have hundreds as you can imagine. Until January, I wish you a final lala salama.